Jura has several so-called ‘speciality’ wines and the sweet Vin de Paille, literally‘straw wine’, is one. Enshrined in appellation law and sometimes in controversy, too often Vin de Paille gets confused, or plays second fiddle to Vin Jaune. Vin de Paille wines are made at varying sweetness levels, from medium sweet to lusciously sweet. The appellation requires a minimum of 14% alcohol and three years of ageing (with 18 months in wood). The grape mix varies widely between producers and vintages but usually there is a blend from Chardonnay, Savagnin and Poulsard, with occasionally some Trousseau (Pinot Noir is not allowed). The grapes are picked early so that they are healthy with good acidity levels. The bunches are then left to dry or dessicate for several months. Traditionally this was in boxes with straw, but today only about three producers do this due to the difficulties of obtaining good straw from the region and also the risk of rot. Occasionally the grapes are strung up and suspended from the rafters, but most usual is to place the bunches well separated into small wooden or plastic boxes. The boxes are stacked up usually in a warm, well ventilated attic area. Regular inspections should be made to remove any rotten grapes. 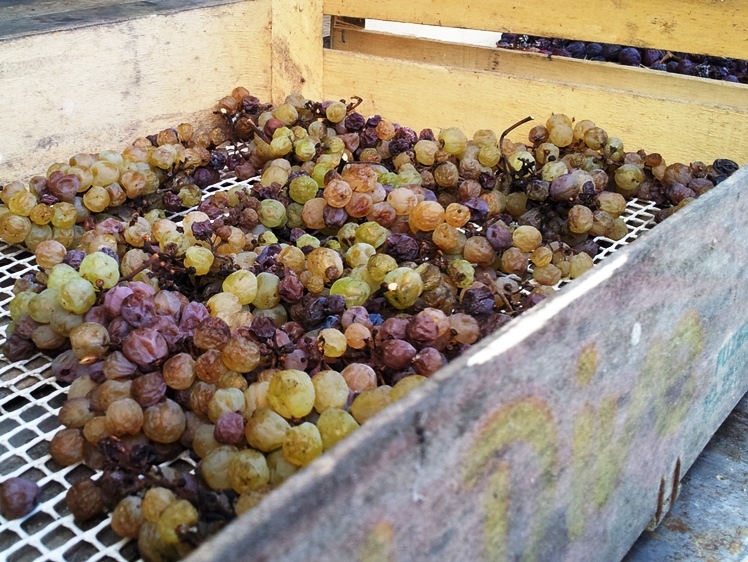 The grapes will gradually shrivel and some beneficial noble rot (botrytis cinerea) may appear. The grape sugar increases up to a potential of 19–22% alcohol and the grapes are pressed towards the end of the year or sometimes as late as February following the harvest. Pressing is usually a very slow process, as is fermentation of the sugary grape juice. Ageing may be in the normal Burgundian-228l barrel or in smaller ones. Some very traditional Jura producers age the wines in oak without topping up so that they gain some oxidative character, others make a fresher style. If red grapes have been used, a slight pale mahogany or reddish colour is apparent, otherwise colours vary from mid greenish yellow to golden amber. The bouquet may include notes of honey, spiced bread or fruit cake, candied fruits or a slight nuttiness if oxidative. Residual sugar levels vary widely from as little as 60g/l up to about 130g/l if the statutory minimum 14% alcohol is adhered to. Ideally there should be good acidity to balance the sugar and this, together with the alcohol ensures extremely long ageing potential. Wines from the 19th century are regularly sold at the annual auction of old bottles at the Percée du Vin Jaune. Certain producers have either accidentally or deliberately made sweet wines in the Vin de Paille style which do not reach 14% alcohol, because of high sugar levels and end up much sweeter than normal Vins de Paille. These wines must be sold under a Table Wine category or other designations such as the lengthy moût de raisins partiellement fermenté issu de raisins passerillés (partially fermented grape must from dried grapes). Some also choose not to age the wine for the statutory length of time in oak, or otherwise, and these too use this designation. Vin de Paille can be added to the appellations Arbois, Côtes du Jura or l’Etoile and very small quantities are made, less than 1% of total Jura production. All producers sell Vin de Paille in half bottles (37.5cl), which vary from a standard Burgundy-style half bottle to a half of the typical Jura bottle, or a modern, square-shouldered clear bottle. Based on an old bottle design, there is also an attractive designated Vin de Paille bottle that was introduced in around 2004, but not made obligatory to use. This excellent book in French about Vin de Paille was published in 2012, written by journalist Philippe Bétry. It is currently out of stock at Amazon, but is sure to be restocked soon.